(1) a body blank (e.g. alder, maple, swamp ash, basswood or poplar) 45mm (1-3/4") thick; the size depends on the desired length and width of the body (350mm x 500mm / 13-3/4" x 20" will be sufficient for the majority of guitars); the blank can be glued up from two or more narrower pieces. 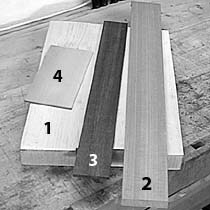 (2) a neck blank (e.g. maple or mahogany) 25mm (1") thick; the length depends on the desired scale length and the width on the desired width of the peghead (690mm / 27" long and 100mm / 4" wide for a guitar; 860mm / 34" long and 115mm / 4.5" wide for a bass); if you glue "ears" to the peghead the width of the neck blank can be smaller (i.e. as narrow as the fingerboard end); mahogany blanks should be quartersawn. (3) a fingerboard (e.g. rosewood, ebony or pau ferro) 6mm (1/4") thick; the neck blank must be 19mm (3/4") thick in this case. (4) a peghead veneer (any beautiful hardwood) 2mm - 3mm (3/32" - 1/8") thick.